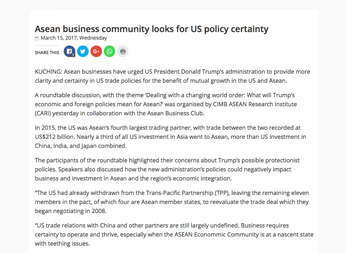 CIMB ASEAN Research Institute in collaboration with ASEAN Business Club held a roundtable discussion on 14th March 2017, with the theme Dealing with a changing world order: What will President Trump’s economic and foreign policies mean for ASEAN? Speakers included Ambassador Michael W. Michalak, Senior Vice President and Regional Managing Director, U.S.-ASEAN Business Council, Inc.; Dr. Arup Raha, Chief Economist, CIMB ASEAN Research Institute; Dato’ Abdul Majid Ahmad Khan, President, Malaysia-China Friendship Association and Exco Member, Malaysia-China Business Council; YAM Tunku Zain Al-‘Abidin ibni Tuanku Muhriz, Senior Fellow, CIMB ASEAN Research Institute and Founding President, Institute for Democracy and Economic Affairs. 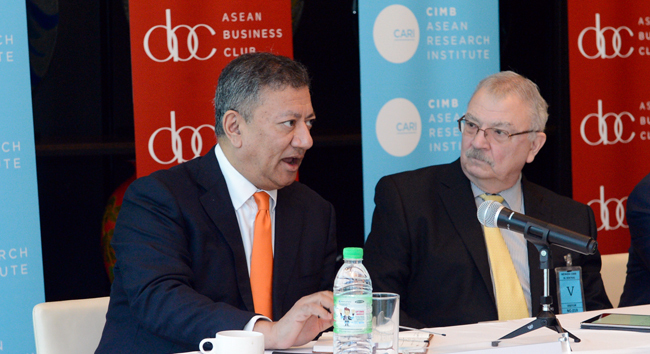 The discussion was moderated by Tan Sri Dr. Munir Majid, Chairman of CARI and President of the ASEAN Business Club. 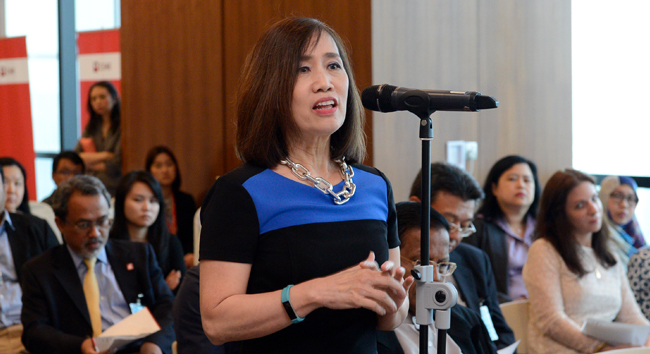 Senior Vice President and Regional Managing Director, U.S.-ASEAN Business Council, Inc.
Amb. Michael W. Michalak joined the U.S.-ASEAN Business Council in September 2015 as Senior Vice President and Regional Managing Director. He oversees the Council’s six offices in the Association of Southeast Asian Nations (ASEAN) from the Council’s regional headquarters in Singapore, leads the Council’s regional advocacy efforts and engages regularly with key ASEAN policymakers and thought leaders to offer his unique perspective on the key role U.S. businesses can play in ASEAN. He also manages, coaches and develops the Council’s most critical resource: its staff. Amb. Michalak most recently worked as an independent business consultant focused on Asia and particularly Vietnam. 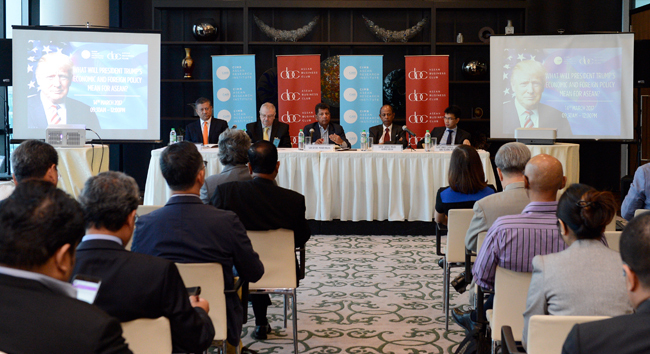 He also served as Senior Advisor to the private sector host committee of the U.S. APEC Year (2011). His diplomatic career with the U.S. State Department spanned more 30 years and included postings to Tokyo, Japan; Sydney, Australia; Islamabad, Pakistan; Beijing, China; as well as Washington, D.C. He served as U.S. Ambassador to Vietnam from August 2007 to February 2011. Prior to his position in Vietnam, Amb. Michalak was Ambassador and Senior U.S. Official to APEC. He also served as Deputy Chief of Mission of the U.S. Embassy in Tokyo. In addition, he received a group award for valor for his actions in a time of crisis when the U.S. Embassy in Islamabad was burned down. Amb. Michalak began his career as a research physicist at Nasa. He holds a Bachelor of Science degree in Physics from Oakland University in Rochester, Michigan and a Master of Science degree in Applied Physics from Catholic University of America in Washington, D.C. He received a second Master’s degree in Public Administration from the John F. Kennedy School of Government at Harvard University in Cambridge, Massachusetts. He speaks Japanese and Chinese. 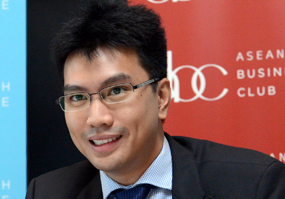 Dr. Arup Raha is the Chief Economist of CIMB ASEAN Research Institute. While his work and interests are global in nature, Arup’s particular expertise is on Asia where he has close to 20 years of experience working as a professional economist in the financial services industry. He was the Chief Asia Economist for global banks such as HSBC, Citi and UBS and also the Head of India Equity Research for JP Morgan. Prior to working in financial markets, Arup was an economist with The World Bank in Washington D.C.
Arup has a Bachelor of Arts (Honours) degree in Economics from St. Stephen’s College, Delhi, a Masters from the Delhi School of Economics and a Doctor of Philosophy in Economics from Vanderbilt University in the United States. Dato’ Abdul Majid is currently the President of the Malaysia-China Friendship Association (PPMC) and Exco Member of the Malaysia-China Business Council. He obtained a Bachelors degree in Economics (Honours) from University of Malaya. In his thirty-four years of service with the Government, he served in the Prime Minister’s Department and the Ministry of Foreign Affairs as well as in several missions abroad (Vietnam, Laos, China, USA and Nigeria). He has also held senior positions in the Ministry of Foreign Affairs. He also acted as the Under Secretary of West Asia and the Organisation of Islamic Cooperation (OIC) and has participated in several Ministerial and Prime Ministerial visits to West Asian Countries and OIC Meetings. During his tenure as the Director General of ASEAN, he actively participated in the organisation of the 30th ASEAN Ministerial Meeting held in Kuala Lumpur as well as the ASEAN Head of Summit and the 10+3 Summit Meetings in Malaysia. In 1998, he was appointed as the Ambassador of Malaysia to the People’s Republic of China and concurrently accredited to the Democratic People’s Republic of Korea until his retirement on 2nd January, 2005. Post-retirement, he continues to actively participate in various conferences and seminars dealing with the subject of China’s Economic Development and ASEAN. He sits on the board of directors of several companies, both listed and private. Tunku Zain Al-‘Abidin is a Senior Fellow of CIMB ASEAN Research Institute; Founding President of the Institute for Democracy and Economic Affairs; a Trustee of Yayasan Chow Kit, Yayasan Munarah, the Jeffrey Cheah Foundation and the Genovasi Foundation; an Independent Non-Executive Director of Allianz Malaysia Berhad and Kian Joo Can Factory Berhad; an advisor or patron to numerous educational and cultural organisations; a committee member of several societies; and a columnist in three newspapers. He was educated at the Kuala Lumpur Alice Smith School, Marlborough College and the London School of Economics and Political Science, where he obtained his MSc in Comparative Politics. He then worked in the UK Houses of Parliament before moving to Washington DC to join the World Bank as a Public Sector Consultant. 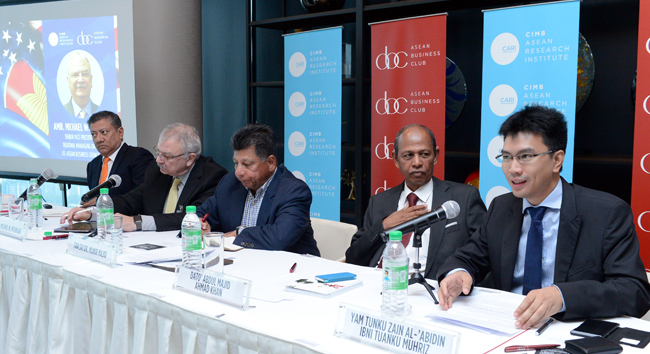 Upon returning to Malaysia, Tunku Zain worked at the United Nations Development Programme and the KRA Group before becoming a Research Fellow at the Lee Kuan Yew School of Public Policy at the National University of Singapore. 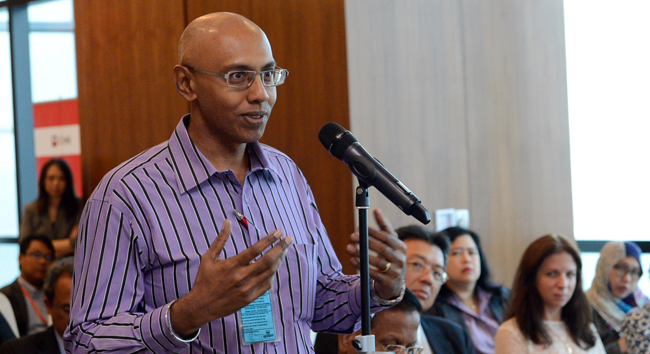 In 2006 he co-founded the Malaysia Think Tank which evolved into the Institute for Democracy and Economic Affairs (IDEAS) in 2010. Since 2008 he has maintained a newspaper column: firstly Abiding Times in theSun, then Roaming Beyond the Fence in the Star and Sin Chew, and now Conservatively Speaking Freely in the Malay Mail, Borneo Post and Oriental Daily. From these articles three books have been compiled, the latest being nominated for the Popular Readers’ Choice Awards. Tunku Zain also authored a coffee table book for the Installation of the Eleventh Yang di-Pertuan Besar of Negeri Sembilan and led a major project to revitalise the State Anthem. An Eisenhower Fellow, he has been selected for various leadership programmes by the governments of Australia, France and the European Union and has received awards for integrity and impact among young leaders. 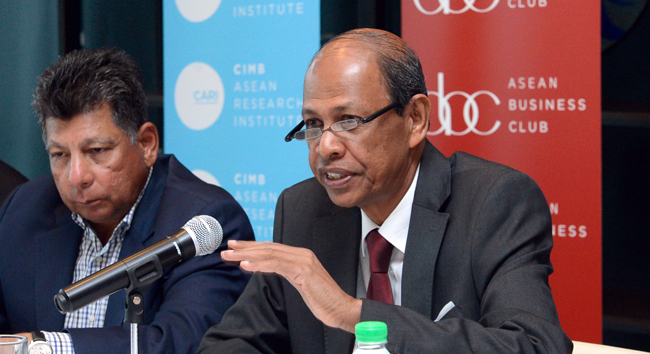 Tan Sri Dr. Munir is the Chairman of CIMB ASEAN Research Institute (CARI) and the president of ASEAN Business Club (ABC). 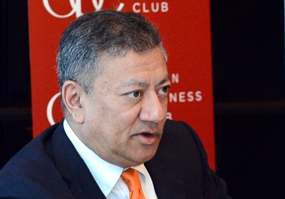 He is also the Chairman of Bank Muamalat Malaysia Bhd, and has been on its board since 2008. He obtained his B.Sc (Econ) from the London School of Economics and Political Science in 1971, and his PhD in International Relations in 1978. 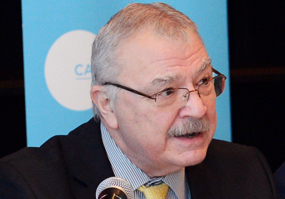 He taught at the Department of International Relations in LSE from1972-1975, and was an analyst for Daiwa Europe NV in London from 1975-1978. 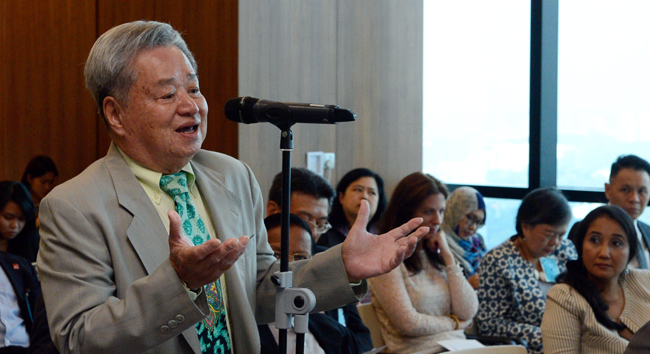 On his return to Malaysia at the end of 1978, Tan Sri Dr. Munir joined The New Straits Times Press (NSTP) as a lead writer and progressed to become its Group Editor. 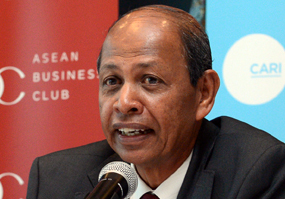 He left The NST in 1986 to become the CEO of a small merchant bank, Pertanian Baring Sanwa (PBS), which then became Commerce International Merchant Bankers, the genesis of today’s CIMB Group. 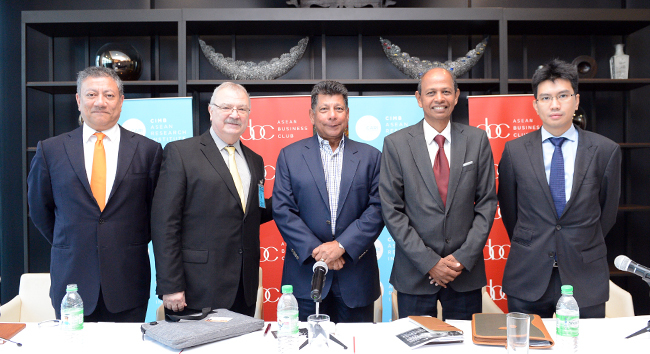 He left CIMB in 1993 at the invitation of the Government of Malaysia to set up the Securities Commission and became its first Executive Chairman until 1999. 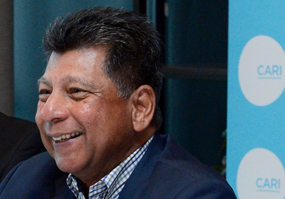 He continued with his illustrious career, serving in various capacities, including as Chairman of both Celcom and Malaysia Airlines System at different times. He was the founder and President of the Kuala Lumpur Business Club (2003-2008), and was the chairman of its Advisory Council. Dr. Munir, an Honorary Fellow, is Visiting Senior Fellow at LSE IDEAS (Centre for international affairs, diplomacy and strategy). 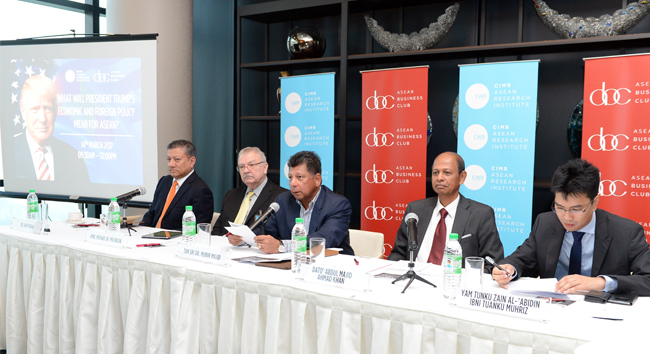 KUALA LUMPUR — Business groups in Southeast Asia are advocating the continuation of open trade policies, just as U.S. President Donald Trump looks to advance his protectionist agenda. More than anything, perhaps, companies across the Association of Southeast Asian Nations bloc want to know exactly where Washington stands. 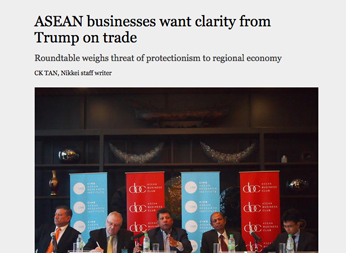 KUALA LUMPUR, March 14 (Bernama) — The Association of South-East Asian Nations’ (Asean) businesses have urged US President Donald Trump to provide more clarity and certainty in US trade policies for the benefit of mutual growth in the US and Asean. 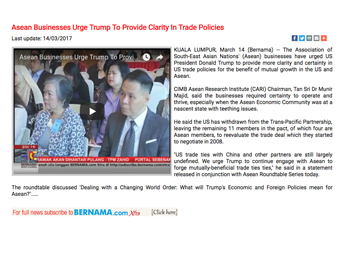 KUCHING: Asean businesses have urged US President Donald Trump’s administration to provide more clarity and certainty in US trade policies for the benefit of mutual growth in the US and Asean. 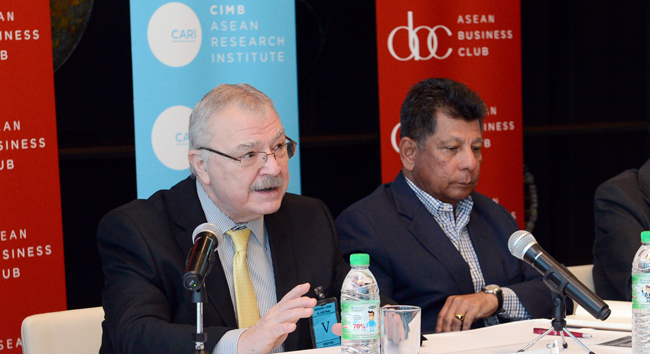 A roundtable discussion, with the theme ‘Dealing with a changing world order: What will Trump’s economic and foreign policies mean for Asean?’ was organised by CIMB ASEAN Research Institute (CARI) yesterday in collaboration with the Asean Business Club.